Official Summary (add to Goodreads): Every page of this book is filled with aspirational and astounding stories about the most influential women to have ever lived. What’s more, readers can step into the lives of these inspirational figures with unique activities, creative questions to answer and captivating topics to give thought to. 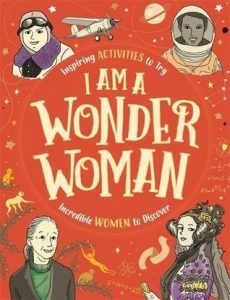 With quirky artwork to bring each story to life, readers can travel the globe and discover remarkable women from across the world, from every kind of profession, with every kind of talent. From American aviator Amelia Earhart and Danish spy Britta Tott, to the Polish physicist and chemist Marie Curie to Mexican activist Eufrosina Cruz. Review: I chose today to share this book because it’s election day in the United States. A lot of women across the country are running for political positions, and while I don’t believe you should vote for someone strictly for or against their gender, I do think it’s amazing that more women are running and they should be payed attention to. I Am a Wonder Woman is a book full of mini bios about fantastic women in history -including a few that fought for women’s rights, including the right to vote. On the left hand side, there is an illustration of the woman being highlighted, as well as information about their lives and the things they have done. On the right hand side, there is some sort of activity that relates to the woman. I think this book would be great for any girl in middle school and beyond. I’m an adult and I thought it was a great look at some inspiring women – and I hadn’t heard of all of them! Since the book is full of various questions and other activities, I do think it would be most suitable for those in middle or high school as they might be more willing to do these extras. I love that all the pages are bright and colorful. This is definitely a book to go through carefully, and hopefully it will introduce you to women in history who did – or are doing – amazing things! If you’re in the U.S., don’t forget to vote today! It just so happened that many of my candidates are women. It’s great! This sounds like a good book too! What a neat book! I might have to check this out for my 11 year old cousin and 15 year old niece! This sounds like a really neat book! I’ll have to share with a friend of mine who has two young daughters and is always looking for a good empowering book like this! Perfect for election day! (And every other day:). Great review. Thanks for sharing! This sounds cool. I love reading about inspiring women. Oh that sounds so interesting. I think women don’t get enough credit for the incredible things they accomplish! I love that it features women that are new to me. Thanks, Lauren! This sounds like a great book to give to a pre-teen girl. There are so many women that have done amazing things. Anything is possible! Awesome!! I need to check this out! This book sounds awesome, Lauren. Thanks for sharing your review and what a perfect day for it. Now that we’re one day after mid-term elections, it’s wonderful to know some amazing women were voted into the House. I love this! What a wonderful way to learn about such impt women. I am getting this for my girls. What a great book. The idea of the images and story being interwoven is brilliant! This is such a neat sounding book! I will look about getting it either for my high school library, or maybe checking it out for sharing with the middle school librarians in my district. I just ordered this for my friend’s daughter. She is really into feminism and females of history who did big things so I thought this would make a cool Christmas gift for her. I’m glad it’s as good as it sounded because I ordered it online and it didn’t give a whole lot of information about the inside or what the pages looked like. That’s the worst part of online shopping, you never really know what you’ll get! Sara recently posted: Then it hits you. I love love love the premise of this book. Wonder if I can get it at the library? I read and reviewed a book called Little Leaders that I think must be similar to this. But your book has the suggested activities which are a bonus. Will be checking for it at the library and suggesting it to my sister, a librarian. This looks like such an inspiring book. I need a copy for my own bookshelf. This is an excellent gift idea for my 11yo daughter! I love that we can learn about strong women outside of the U.S., as I admit I’m not brushed up on those.